Its always good to follow people who tweets matching your interest area but its equally important to unfollow spammers and dead accounts. There are several websites available over the internet which helps you identify and understand your Twitter followers. I discussed about Qwitter around couple of years ago which sends you a weekly email telling about people who unfollowed you. One of the tools under discussion today will tell you about your followers and other will let you follow or unfollow them. This website generates a line graph for number of followers in a weekly, monthly, quarterly or 6-monthly formats. You can also generate similar graph for following i.e. accounts which you follow. It also allows you to create a bar graph for number of tweets made by you over the same time frame. You can also select an option to receive these stats delivered in your email on a weekly basis. This website provides you few useful stats regarding your account such as average daily change in followers and following in addition to you global ranking on the basis of your number of followers. You can also compare your stats with 2 other twitter handles to track your growth with other users. Another nice feature of this website predicts your follower growth after analyzing the past trend or activity of your Twitter handle. You may also get suggestions to improve your twitter account using their Profile Checker feature. This service is an easy way to find all those Twitter accounts that you follow but they are not following you back. This will help to easily identify people whom you can unfollow or more importantly generating a list of people whom you can not send DMs. 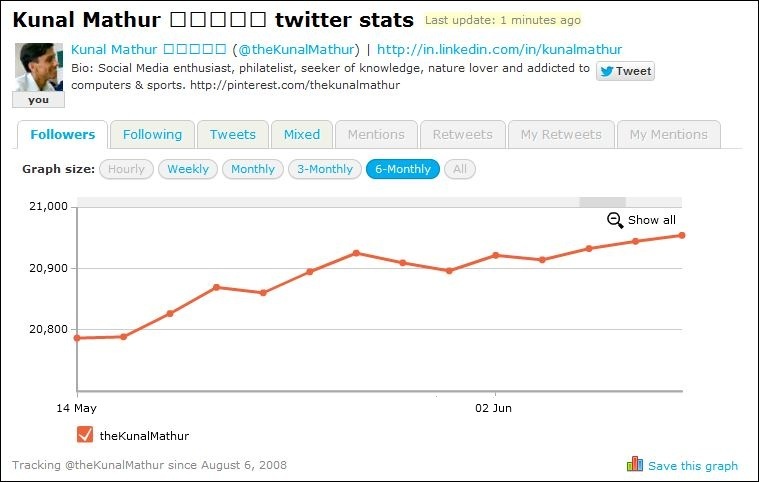 Simply enter your Twitter handle (like @thekunalmathur) in the big text box on Friend or Follow homepage and it will generate a grid of accounts that are not following you. You may hover on Twitter display pics to get more information like name, location, bio, following & follower count , number of tweets and last tweet. You may further filter down these stats by Verified, Protected or Normal accounts and have a functionality to view it in List or Grid view. It also allows you to find out your Fans – people who follows you but you don’t follow them and Friends – people who you follow that follows you.